The British ornamental horticulture sector is worth £750 million to the UK economy and provides jobs for 15,700 people. We believe shoppers should back British growers by buying British flowers whenever they can. Not only will they be getting great quality, long-lasting flowers, they’ll also be helping to boost the UK economy. When are British flowers in season? After a long dark winter, nothing quite heralds the coming of spring like bringing home the first vibrant bunch of scented narcissi or glorious full-headed tulips. Despite the wide abundance of flowers at our fingertips (many of which are imports), seasonal springtime flowers continue to be popular - perhaps this is why tulips and daffodils make up over half of the ‘seasonal’ flower market in Britain. 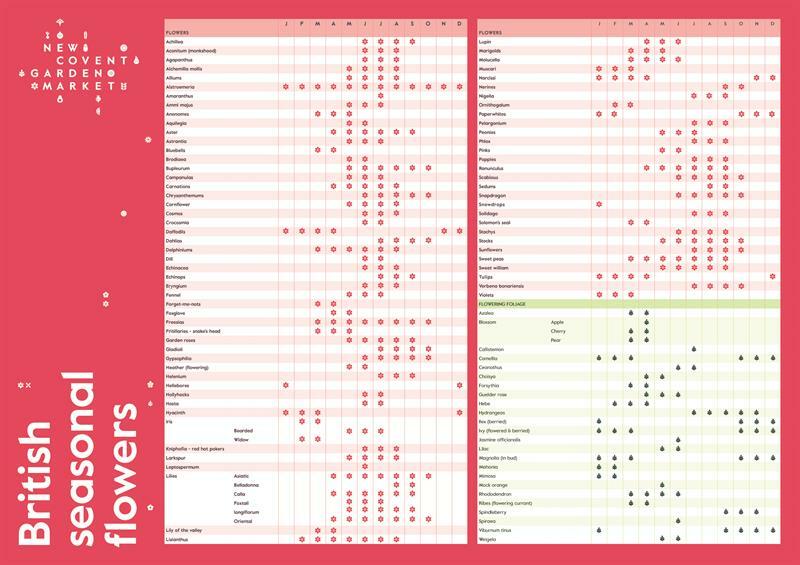 The New Covent Garden flower market has put together a seasonality chart for British Flowers Week (which runs from 10-16 June 2019). This showcases what flowers are in season throughout the year. Support British growers by looking for these seasonal products and asking for them specifically. Click on the image below to download the chart. Some flowers (and arguably very popular ones, such as long-stem roses) have largely been outcompeted by trade from overseas, whose warmer, lighter and more predictable climates allow them to grow and import flowers at a lower price than it would cost UK growers. However, our cooler climate is perfect for many other flowers and foliage. How can I buy British flowers? With just 10% of flowers sold in the UK being home grown, how do you know that you are buying British? Unlike many other European countries, the British cut flower market is dominated by supermarkets. There is no legal requirement to label the origin of cut flowers, but many retailers are proactive when it comes to labelling British (although less transparent when it comes to the country of origin for imports). Next time you buy cut flowers from the supermarket, look for country of origin by checking for a Union Jack sticker or ‘Grown in the UK’ on the label. Florists occupy a smaller proportion of the British flower market compared to supermarkets, but to make sure you are backing British growers, ask them if they stock British flowers. FloraBritain is a collaboration of larger British growers that sell their blooms under one label making it easier for florists to source British flowers. Visit Flowers from the Farm to find a local flower grower and florists that use seasonal British-grown flowers. If all the pin trays we used for a season of tulips were placed end to end, they would reach from Spalding to Peterborough and back - over 45 miles! Why should I choose British flowers? They have a superior scent and will brighten up any room! ​Daffodils contain galantamine – a compound known to slow the progression of Alzheimer’s symptoms. Welsh bioresearch company, Agroceutical Products, grows and harvests daffodils in the Black Mountains to help Alzheimer’s patients. The company grows its daffodils 1,000 feet above sea level in the Black Mountains in Powys, which means they produce more galantamine than daffodils grown anywhere else due to the altitude. Once harvested, the daffodils are processed and supplied to pharmaceutical companies to be crystallised into prescription tablets and capsules. The company’s team of five produces 20 kilos of galantamine per year, helping over 9,000 Alzheimer’s patients across the world. Find out more about daffodils and Alzheimer's. DEFRA's most recent report - The economic impact of ornamental horticulture in the UK - published in October 2018 - reported that the British ornamental horticulture sector is worth £750 million to the UK economy and provides jobs for 15,700 people. Ben Cross, of Crossland Flower Nursery, in Walberton, on the edge of the South Downs National Park says British growers are at risk of going under if they’re not supported by shoppers, the big retailers and government. In the face of foreign imports, the home-grown industry is in “dire straits”, he says. “We used to sell 500,000 flowers each year to the big supermarkets but that has reduced to 100,000,” adds Ben, who runs the family business – three acres of glasshouses – alongside his father Dave. “We used to send hundreds of English flower boxes to the big wholesale markets – Covent Garden, Western International and Spitalfields – but I’m lucky now if I send a total of ten. With approximately 90% of flowers sold in the UK being imported, Ben would love to see the buy British trend extended to flowers. Sue Lamb runs Lamb’s Flowers Ltd - a small family business - with her husband Roger and son Gareth. They have been commercially growing flowers for almost 30 years. Q: Hi Sue – First of all, have you always been flower growers? A: No not at all! Roger used to work in agriculture, but my career was in engineering. We bought a 4.5acre field and built our own house before deciding to quit our jobs and try our hand at flower growing. A: First of all we erected some poly tunnels so we could grow Dianthus (known more commonly as pinks) outside and under cover. Then we put up 1/4acre of new glass which we filled with Alstroemeria. Q: What kinds of flowers have you grown? A: We’ve tried to growing lots of flowers – some work better than others. We’ve gradually increased our growing area over the years and now have 10acres of glasshouses, plus cold stores and a pack house on site. Q: That’s a large area! Surely you can’t manage all that yourselves? A: No, we employ people to work on the farm too. We currently have 18 full time staff plus 15 seasonal students - over half of them are returnees. Q: Can you explain the growing process from start to finish? A: Each year we grow 14–15million tulips hydroponically (using mineral nutrient solutions, in water without soil) and they flower from mid Dec – late May. We buy the bulbs from Holland as we need them. First the bulbs are planted on pin trays which act as an anchor. The trays are filled with water, and put in a rooting room for 2–3 weeks at a temperature of about 6 deg. This allows them to develop nice white roots before they’re taken to the glasshouse, laid out, and topped up with water daily. They continue to take up water but also get an oxygen supply. In a further 2–3 weeks they are ready to crop. After cropping, a machine removes the bulb from the stem. Each stem hangs upside down as it travels round the machine and is analysed using both camera and x-ray. The machine bunches together stems of the same maturity in the requested configuration (8’s, 9’s and 10’s). Each bunch is cut to length, fed to a collection belt, and taken to a sleeving line where it goes into a labelled sleeve and is mixed with other colours. Next it’s placed in a box ready for delivery to supermarket depots where it is distributed to stores for sale. Q: What technology have you adopted on the farm? A: The machine we use means we can process more than when the handling was done manually, and enables us to up skill our work force. We also operate a packing service for other farms who bring their locally grown products to us for packing. Q: How many flowers do you grow a year? A: Each year we grow just over 20million stems! That’s made up of 14–15million tulips, 4million stocks, 0.5million Lisianthus and Antirrhinums, and 300,000 ornamental brassicas. Q: Do you grow flowers in the winter too? A: During the winter we mainly grow tulips. It’s a bit more restrictive because of the low light levels. Q: Where do the flowers you grow end up? A: The majority of our flowers are sold to big supermarkets. Our main customer is Waitrose, and then Asda, but we also sell to several direct mail companies.